Now hold on to your hats folks, what I am about to say may come as a bit of a shock to some of you. You ready? Red, black and white just might be my favourite colour combination. For a girl that had a mostly black wardrobe, red was my “gateway drug” so to speak into the colour wheel. It can be classic, sultry, strong, feminine and fun all depending on how you style it. Once I dyed my hair black (I was red for over a decade) red was easy to integrate into my wardrobe. I no longer had to worry about it clashing with my hair. So, here I am in one of my more playful combinations of red, black and white. The skirt is actually a dress that I cut down since I was unhappy with the fit of the upper half. 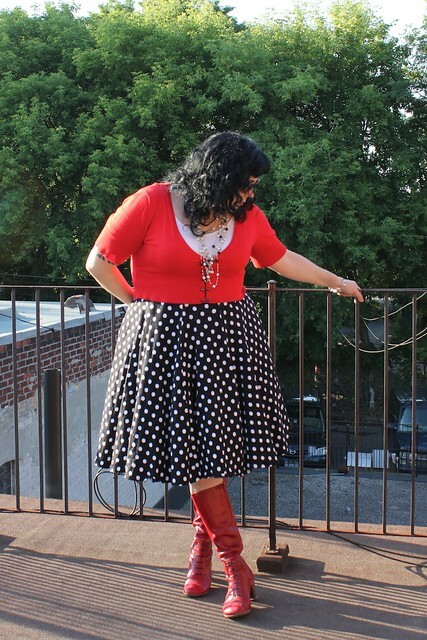 I loved the big polka dots and twirling in this skirt is fabulous enough to try and save it. I still have some finishing work to do but I’m pretty happy about it. In fact I am already eyeballing a few underused dresses hanging in my closet. 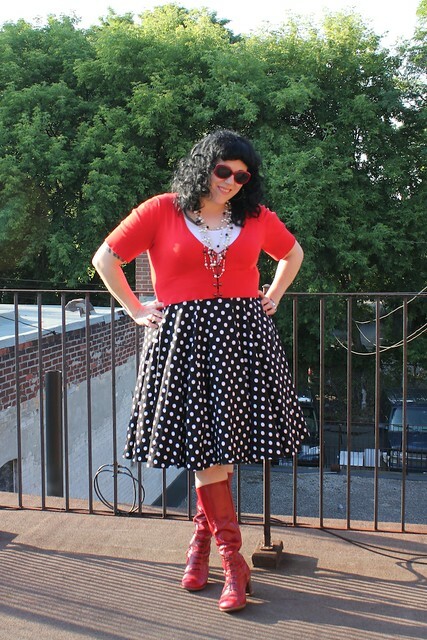 I paired the skirt with a red cropped cardigan, white tank and some black and white beads. The day ended up being a bit warmer than I had thought and I probably should have worn shoes instead of boots, but oh how I love these boots. I am so happy that fall is here so I can pull them out again. You look GREAT! I love pretty much everything about this outfit; the oh-so-cool buttons on the cardigan, the polkadots, the way the skirt falls, and those boots!! And the orange-tinted red of the cardigan looks really good on you, which isn’t something that’s true for a lot of people. completely adorable outfit & killa boots!! i’ve wanted some fluevogs for a couple years now but never seem to have the money.. like ever! Anyways they look fabulous on you, as does everything about this outfit! Thanks Emma! I certainly love my red boots!